Glock 19 9MM, and I sometimes pocket carry a Ruger LCP II .380. And yes--I rarely take the round out of the chamber in either. Only to clean them. If I ever had to draw it and fire, I really don't need to be spending the time to chamber one. All my handguns that are in my current carry rotation, mostly Glock 19 and XDs .45......along with the M&P 9 stay chambered. AR is not, and the shotty stays in "cruiser" mode. No that doesn't mean my shotty roams the streets looking for action, shells in the tube, not chambered and safety off. I only carried for about 2 1/2 years for a temporary job, a G19 with RMR dual illuminated sight in a 5.11/BladeTech level 2 holster. We were all required to have a round in the chamber, regardless of type of firearm. If I could carry concealed in this state, I would also always have a round in the chamber. For the night stand, I have the pistol with the mag partially inserted, no round in the chamber. I sleep hard and wake up slow and want to make sure I’m alert enough to know what I’m doing so it’s a little “test”. Yes, I know the risks. Would you please enlighten me regarding the "safety key" you reference in your post. I have this model Walther and my daughter (age 63), has shot it several times in the recent past and really likes the way it fits her hand and she is very comfortable shooting it, and has decided that it would be a good choice for her to have as a " night stand" home defense gun. They live out in the county with no immeadiate neighbors and they do not have a dog. Her husband does a little bit of traveling on occasion, job related, and she likes the idea of having a home defense firearm next to her bed when she is alone. where as my daughter grew up in our house with all kinds of firearms.........She (in her younger years before marriage), on occasion would join me at the shooting range.......so she is familiar with hand guns in particular. The only aspect of the Walther P99 AS, that she doesn't like, is that it doesn't have an external 'safety'. Thus my question re the "safety key" you mention. Thanks for your opinion and information. Hello - Sorry for the late response, I've been out of town for a few days. The term "safety key" is one that I came up with, or "external safety", as you referred to it. 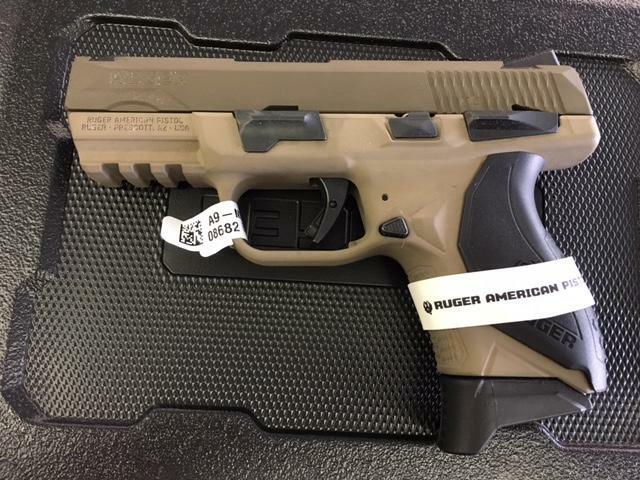 It's found on the Ruger P Series pistols, it's not an accessory you can buy and add to any other pistols. 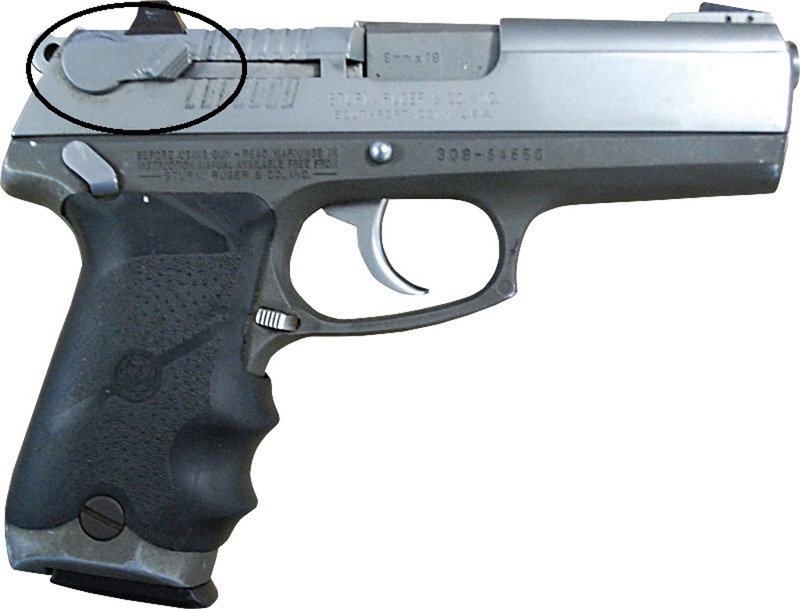 Below, I included a photo of the Ruger P-94, it's the item that I circled in the image, and it's accessible from both sides of the weapon. If you want the weapon to be safe, you push it down, and up to fire it. Other Ruger models have that feature also. The feature may also be available (in one form or another) on other brands of firearms. My carry guns are always chambered and ready to go. No safeties either. That's why I carry a Glock. One in the chamber, no external safeties and it's as reliable as an AK-47. I've seen/heard enough stories about the SHTF and the intended victim trying to shoot without racking the slide or disengaging the safety. One particular situation sticks out. Victim had a 1911 in a holster, without one in the chamber. Victim and four others were surprised by a gunman, who ordered them into a room and put them face down on the floor. The gunman was very good about keeping his eye on everyone. The victim had surreptitiously removed his 1911 and when the gunman started to look for the victim's wallet, he felt the holster. At that time the victim attempted to chamber a round, but the gunman fired, hitting the victim in one hand. The victim finally managed to rack a round, but because he was wounded, he wasn't able to squeeze the grip safety tightly enough. By the time he finally did so, he had been wounded again, but did manage to return fire and end the threat. At least he didn't have the safety engaged, or he probably would have been dead. If he'd have had a Glock with one in the chamber, the outcome would have been much different. A fool and his unchambered pistol are soon parted...at the hospital or the morgue. Last edited by AlaskaErik; 09-30-2018 at 08:07 PM.. When it comes to SHTF single actions is a no go unless it's cocked and locked. I prefer double action with a round in the pipe. I carry a Beretta PX4 which is DA/SA so the first squeeze of the trigger is double action and the follow up is single action. This allows for very fast follow ups. It's loaded with Fenix FXP 9mm +P (Gold Dot in ShellShock casings). Excellent ammo for the money. The best self-defense gun is the gun you have with you when you need it. That's just generalization. In other words... horse s**t.